Welcome to new staff at Forestdale! 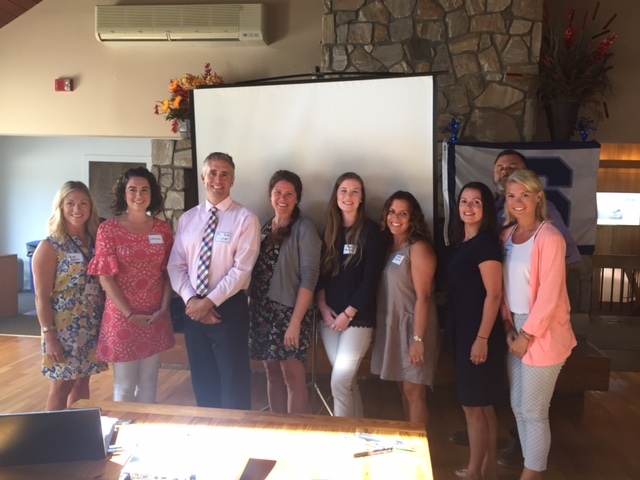 At the New Teacher Orientation on August 28, 2017, Forestdale Principal Marc Smith introduced his new staff members with the following remarks. We welcome these new members of the Sandwich U-Knighted family. Rachel Darsch – Part time social worker at FD. Before coming to us she was working as in in-school therapist for South Bay and attached to schools in Plymouth. What stood out in her interview process what her genuine care for students and a strong knowledge-base of working with students to develop both coping skills for anxiety as well as for regulating their own emotions. We are looking forward to working closely with Rachel to help support a growingly diverse set of social and emotional needs in our school. Alyssa Pestilli – Alyssa joins the Forestdale School after over a dozen years working as a school adjustment counselor/social worker in Falmouth. Alyssa is a Sandwich parent and shared in her interview that she is excited to contribute to a school community that she has come to love as a parent. She brings with her a deep knowledge base and a very strong collection of references and recommendations. Her former principal told me that it took her a day to recover from the news that she was losing Alyssa… that not only was she losing a fabulous employee, but a trusted confidant and friend. Jennifer Munk – I introduced Jennifer at this same event last year. At that time I was introducing her as a new ESP within our Spinnaker program. Today, I get to introduce her as our new integrated preschool teacher. Jenn is replacing a long time and well-beloved teacher in our district; however, from everything I have seen in her working in our school as an ESP, along with what she demonstrated during the interview process, I know that we have done an excellent job filling some pretty big shoes. Raquel Lodge – Raquel joined our Sandwich Team once school was in session last year and did not get the opportunity to be introduced to our community. Since joining our EL team, Raquel has made a lasting impact on both the students in our school as well as our staff. One of Raquel’s many attributes that stood out to me in working with her, is the never ending smile she has on her face. Her smile is warm and welcoming to the students and sets a safe and supportive climate in her classroom. April Silva – April joins our Spinnaker team this year as an ESP. April has a lot of experience working in both an early childhood setting as well as in an ABA environment. April mentioned in her interview that she was looking to join a supportive, collegial community of workers and I am confident that she will find that with us at Forestdale. Aubrey Williams – Aubrey will also be joining our Spinnaker team as an ESP. Aubrey is a recent college graduate who is looking to pursue a Masters in Education. She shared with us in her interview that this role interested her because it gives her the opportunity to learn more about the field she hopes to make a career. We look forward to supporting Aubrey in her career plans. Lorissa Slagle – Lorissa is another new member to our Spinnaker team of ESP’s. She is a certified elementary teacher in the state of Missouri where she attended school. Lorissa shared in her interview that she has a strong passion for students and finding ways to engage them in the learning process. She shared that her background in theater supports her in making learning fun for her students. Sarah Balkam – Sarah is the fourth hire this summer to replace staff that have moved on from our Spinnaker program. She too is a recent college graduate looking to become a teacher. She shared in her interview that she is excited about the opportunity to learn from this experience and develop a set of knowledge and skills that will support her as a classroom teaching in the future. We are very excited to have April, Aubrey, Lorissa and Sarah joining our Spinnaker team and know that they will be great additions to our already fabulous team working in that program.